Looking to raise some money for the bride and groom? Our variety of casino games offers a new and exciting element to your traditional engagement party. The games are simple and familiar so all of your guests will be able to enjoy. It’s the perfect way raise money while entertaining your guests and keeping the elegance of your event. We have multiple games including blackjack, poker and crown and anchor wheels. All games are easy to transport and set up. We will deliver the games right to your event and pick them up at your request. Our casino games are perfect for fundraising events, entertaining at parties, spicing up anniversaries,bachelor/bachelorette parties and stag & doe’s. If you are unsure how to play any of the games you can click the details and find an instruction page. Roulette is a game that is often played in casinos. People often bet real money on the game in order to earn more money. Roulette originated in 17th century France and has since made its way into almost every United States casino. The Monte Carlo in Monaco is one of the most popular casinos and has many tables of Roulette.The basics include eight players sitting at a table who play against the house, which is represented by a dealer. 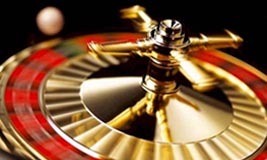 In front of the dealer is a roulette wheel – the dealer also handles the bets and payouts. Depending upon its location, the roulette wheel may have anywhere from 36-38 slots. In the United States, the wheel has 38 slots, whereas in Europe most have 36 or 37 slots. Before the round starts, each player buys chips to get into the game. They use colored chips instead of cash chips so their bets don't get mixed up. If you have won at the end of the round, you will receive cash chips back. These cash chips can then be taken to the casino cashier in exchange for real money. This system is used in an effort to combat cheaters who might sneak in money or other chips into the game. Raising money at an engagement party? Our raffle drum adds a look of elegance to any contest or event. Our drum comes in a solid gold colour and weighs about 6lbs. It stands 20” high and holds approximately 5,000 regular sized raffle tickets. The drum measures at 12” Deep x 16” Long. The base is 14”wide x 17” long. Our drum is especially useful for contests at car dealerships, schools, radio stations or social events. Call us today and book your raffle drum rental. Available in both green and blue. This new portable felt has a layout for the popular casino game, Blackjack. Blackjack is a game played in Casinos around the world. Now bring the excitement of casino gaming to your home. The Layout is 36" by 72" and can be easily used on a home table for parties. The layout travels well and is water resistant. Great for any party!